Sam, your dates are the best I have EVER tasted. I thought I knew what at fresh date tasted like, but your dates are more moist and more flavorful than any I have tasted. Your Safari Dates are quite good too. Thanks for the Farm to you experience. Love those Safari dates. You are on to somthing. I love the nutty-sweet taste of them. Enjoyed stopping by the date stand at your farm. Your dates are the absolute best...hands down! Thanks for the tour too. Sam, my wife Joan and I stopped by your farm this past Saturday and purchased the best dates we have ever, ever had. Your dates are the best. Super moist and flavorful. I was so impressed that I had to let you know. Thanks for the farm experience. To leave a comment, please select the Sign In button above and sign into our guest book section with your email address. Or, to view additional comments already made, select View Entries. 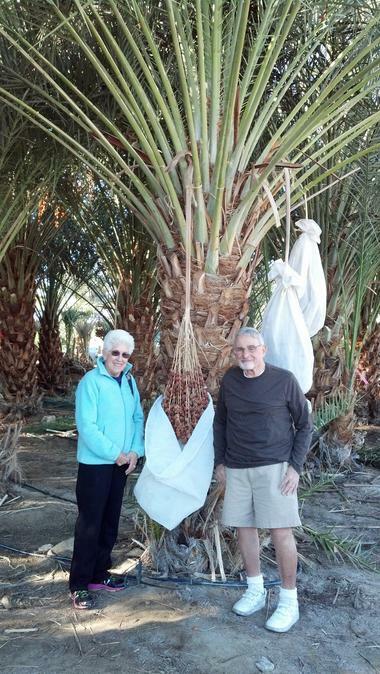 This was our second visit to Sam's Date Farm and what a delight to see Maxine again and get an up front glimpse of the Palms that yield such a wonderful variety of dates. The effort and love that goes into their production is unique and therefore so are their crop(s). One of our all time favorites are the Black Gold. We'll be back soon and hopefully meet Sam.